The Grand Ole Opry House is home to “The Show That Made Country Music Famous,” The Grand Ole Opry! Housed on the same property as the Gaylord Opryland Hotel and Opry Mills Mall, this theatre seats 4,400 with a balcony that wraps 170 degrees around the stage. The stage is approximately 130 feet wide and 60 feet deep. There are two loading doors each 18 feet wide and over 24 feet high. The warm up area and equipment storage area are located in Studio A, which is comparable to the stage in size. 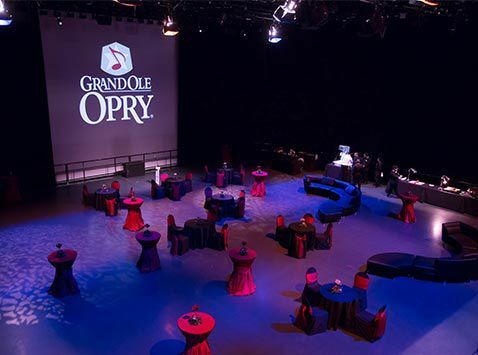 A part of the world-famous Grand Ole Opry House, Studio A was once home to HEE HAW and has continued to host television shows such as Crook & Chase, CMT’s Crossroads, Invitation Only and NASHVILLE.